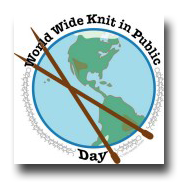 On Saturday, June 13th, World-wide Knit In Public Day, we will meet at CC's Coffeehouse in River Ranch from 2pm to 4pm for some fiber fun. We hope you will join us and encourage your friends and family to do so as well. This will be a great opportunity for the Yarn Nookers to get together and share our knitting love with the public. Please come by and bring a project or two to work on!